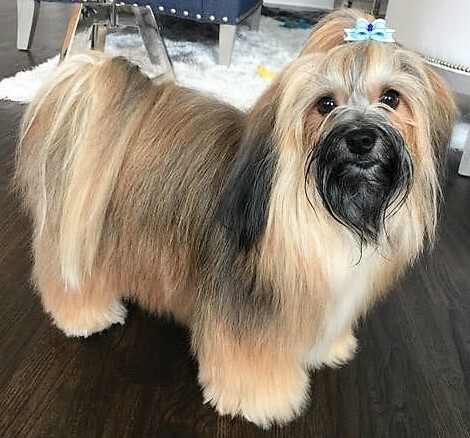 “Molly” is a 3-year-old FS Havenese dog who presented to Dr. Gimmler in August 2017 for itching and skin infections since 1 year of age that got worse after moving from Oklahoma to Texas. Her itching would get better on steroids, but it would always come back once drugs were stopped. A previous blood allergy test performed in OK showed that she was allergic to a few environmental pollens and allergens (Johnson grass, June grass, Orchard grass, Penicillium mold, Aspergillus mold, Ragweed, Lamb’s quarter, and house dust mites.) 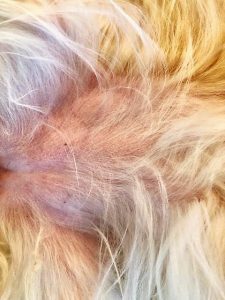 When Dr. Gimmler examined her in August, she had redness on her belly, armpits, and paws with some epidermal collarettes (circular areas of flaking) and pustules (white heads), which are a sign of skin infection. Cytology (skin samples viewed underneath the microscope) confirmed that her skin was infected with Staphylococcus bacteria and Malassezia yeast. Dr. Gimmler performed an intradermal allergy test to pick up any allergies the blood test might have missed, and found she was additionally allergic to: Bermuda grass, Cockelburr, Kochia, Russian Thistle, Mountain Cedar, Elm, Oak, Malassezia, Staph, and flea saliva. All of her positive reactions were combined into oral allergy serum (sublingual allergen-specific immunotherapy, or “SLIT”) with 2 pumps delivered into the mouth twice daily to desensitize her immune system and help her have fewer allergic reactions over time. This treatment is very safe with no harmful long-term side effects. Dr. Gimmler also treated her skin infections with a Covenia antibiotic injection for the bacteria, MiconaHexTriz shampoo for the yeast, and Simparica oral flea prevention for her flea saliva allergy. 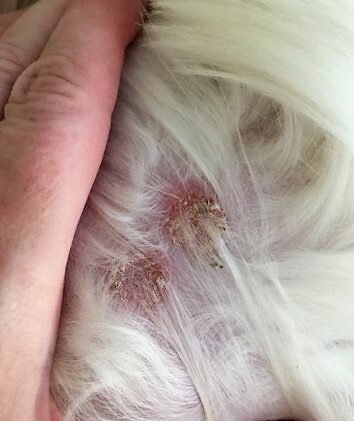 A few weeks later, she was still getting new spots of bacterial infection despite the Convenia, so Dr. Gimmler performed a skin culture (sent a live sample of “Molly’s” bacteria to the laboratory to find out what antibiotics will kill it). The culture showed that Molly had methicillin-resistant Staphylococcus pseudintermedius. This occurs when patients have had recurrent bacterial infections and been exposed to antibiotics multiple times (the bacteria mutates and becomes stronger so regular antibiotics will no longer kill it.) Luckily there were still some safe antibiotic options, so Dr. Gimmler changed Molly to Zeniquin (marbofloxaxin). One month later, her infections were totally resolved. Since then, she’s continued on her sublingual allergen-specific immunotherapy long-term, and she’s been doing great with no relapse of infections!